With the Kinergy 4S, tyre maker Hankook is launching a brand-new all-weather specialist developed for European road conditions. Representing the fourth generation of all-season tyres from Hankook, the new Kinergy 4S is geared toward continuing to offer drivers in Europe an alternative that features balanced performance and safety through all seasons, including climate change and future legal requirements. The new tyre’s asymmetrical tread combines summer properties related to performance and safety on its block-tread outer side and tested suitability for winter conditions on the inner side, which features 3D sipes. The new Kinergy 4S will be launched in many popular sizes from 14 to 18 inches starting in the second quarter of 2015 and is available as original equipment on some models from leading vehicle manufacturers right away from market launch. With its new Kinergy 4S (4S - Four Seasons) all-season tyre, premium maker Hankook is continuing to gear its activities toward quality-conscious, ecology-minded drivers who prefer not to change their tyres every six months, but do not want to – or have to – go without balanced performance and safety. The Kinergy 4S is distinguished by its especially harmonious performance features across all seasons. This makes the tyre an attractive alternative when it comes to ensuring legally compliant year-round mobility as weather conditions in Europe become increasingly changeable. The tyre can be used all year round even in countries with seasonal winter tyre requirements, as it bears the M+S and snowflake symbols (which will be required for winter tyres in Europe, as elsewhere, starting in 2018). 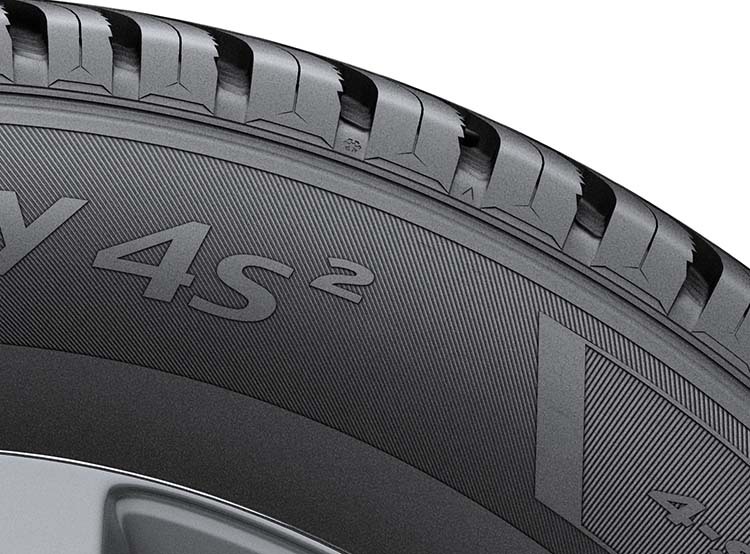 A true all-weather specialist, the Kinergy 4S combines the advantages of a summer tyre – short braking distances and good driving characteristics on both wet and dry surfaces at higher temperatures – with the benefits of a winter tyre, especially in the areas of traction and braking performance under cold conditions or with moderate snowfall. With their asymmetrical tread configuration, the new generation of Hankook all-season tyres adopts major design elements from its successful predecessor type, but the new tyres have been fully redesigned, as the new name also indicates. The “summer shoulder” of the Kinergy 4S has been given a larger block structure in combination with stepped tie bars between the blocks, aligning it in particular to the more stringent requirements that apply when driving in dry conditions at higher temperatures. Its five-rib tread design also offers excellent stability. Special summer sipes on the outer tread blocks deliver better steering precision even when driving briskly on a dry surface. At the same time, the extra-wide belt package and highly dispersed silica tread compound for maximum bonding of silica and rubber make the tyre especially durable and reduce wear, extending the tyre’s lifespan and boosting cost-effectiveness. In combination with four main grooves of which the outer one comes in slanted design, this ensures optimum drainage, shedding water (or even slush) from the tread with high efficiency and effectively guarding against hydro- or slush planning. The tyre’s inner tread has a winter design, with a higher number of sipes and blocks providing secure braking abilities in fall or winter weather conditions. An optimised tread surface with V-shaped crosswise grooves also enables controlled handling on snowy roads. Winter tread wear indicators incorporated into the tread grooves at regular intervals also make it quick and easy for drivers to check whether the tread meets the minimum depth requirements for winter tyres. “In developing our new all-season tyre, we focused on achieving a further improved combination of crucial winter and summer features in a single tyre in order to offer drivers a high-quality alternative to regular summer and winter tyre changes. With its balanced design, the Hankook Kinergy 4S can be a real alternative when it comes to staying mobile all year round – safely, legally, and without a lot of fuss. This is especially true in areas that tend to get less snow and have a more moderate climate.